It's no secret that I'm a rose-lover, as well as a longtime Lush shopper, so there was little chance that I'd be able to ignore Lush's limited edition Rose Jam Shower Gel. Rose Jam's fragrance is an "indulgent blend of rose, vanilla and lemon leaves," the same blend that shows up in Lush's Ro's Argan Body Conditioner (cleverly named for Rowena, one of Lush's product inventors) and Rose Jam Bubbleroon (a solid, dissolvable bubble-bath treat). 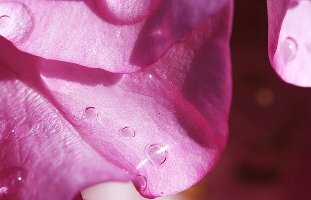 The ingredients for Rose Jam in its shower gel format include real rose absolute, Egyptian geranium oil, Sicilian lemon oil and vanilla pod infusion. If you've ever read or heard about Lush's system of purchasing rose by-products for its perfumes and lotions and bath potions, you already know that the company really puts a lot of thought and effort into obtaining these precious oils and waxes. (You can watch a seven-minute video explaining the whole process here.) If you're a rose-lover like myself, you really should try to get your hands on some Rose Jam, if only to sniff it. The rosa damascena at the heart of its scent is true and lush, and it seems far richer and headier here than it does in Ro's Argan or the Rose Jam bubble bar. In addition to the rose, the geranium and lemon, and the vanilla infusion, there are probably some synthetics to round out the composition. However, the final blend really does make me feel as though I'm diving into a sea of rose petals. This is a deep, wine-y rose fragrance, with hints of berries and spice. It also has an under-layer of sweetness, although it's not a gourmand fragrance; it would probably feel a touch too syrupy for hot-weather use, but for fall and winter, it's heaven. Like many of Lush's body products, Rose Jam isn't exactly cheap. On the other hand, some other high-end niche toiletry company would put a product like this in a fancy bottle with a gilt label and charge twice as much — that is, if any other company went to the trouble to make anything similar, which they don't. 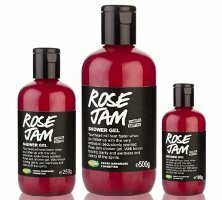 Lush Rose Jam Shower Gel is available in 100g ($10.95), 250g ($19.95) and 500g ($29.95) bottles. For purchasing information, see the listing for Lush under perfume houses. Note: top image is Sparkle [cropped] by quinn.anya at flickr; some rights reserved. I really need to sniff more from Lush. I love what I have sniffed so far from them. Potion being my fave..oh, that is the *best* carnation! Glad they still sell the lotion. I also have some of Lust which is warm, big, giant jasmine! I do like rose…but I can get bored of it quite quickly and I look for something else to wear sometimes. I just blind bought Tea Rose by TPW cause it was so darn cheap. That 4.2 oz bottle will be enough rose for me for my lifetime! But like I said, I wouldn’t mind trying this one at all..since it seems I like things I have sniffed thus far:D.
Potion lotion!! I need to order some from the “Retro” section of their website. One of my favorites! Nice tastes, Jessica:D. Potion lotion is on my Christmas list. I’d like something be gifted to me every once and a while..instead of me just buying things for myself, ya know?:D. Maybe I will feel/look less guilty come Donatella time:D.
Though, lotion doesn’t count, right?:D. I think you might. You should at least try to get to a LUSH to smell some! I am sold…my only worry is the shelf life. I have too many shower gels, like everything else, so have had at least 1 Lush gel go bad before I used it up, and that was the smallest size. What’s the longest you’ve managed to keep a Lush shower gel? I’ve definitely kept shower gels (and other Lush products) past the due date — I think that storing them in the refrigerator helps! Well, that might not work with the “fresh” face masks and other skincare, but for non-facial products, I think you can stretch things out a bit. Having read the amazing reviews of the Ro’s Argan Body Conditioning Cream I had someone bring it for me when they came back from holiday. I found the scent a little disappointing; it reminded me more of the Body Shop’s strawberry scented products more than actual rose. I do enjoy Imogen Rose, though its not my favourite rose scent. I do like Imogen Rose very much — especially in its solid perfume format, for some reason. It smells softer and more powdery than the liquid, but it lasts nearly just as long! I only have the solid one! (haven’t tried the other). Did you find the scent of the conditioning cream rose-y? I may have my olfactory nerve for rose crossed up with the one for strawberry?! It’s a fruity rose, I think — but to me, many roses *are* fruity, maybe? I really prefer the scent of the shower gel — it just seems deeper! Great review – it’s enough to make me want to brave the horror of a Lush shop -and I usually find the experience nauseating. I assume that in all other countries they are all the same and you can smell them from a mile away. The only fragrance of theirs that I really like is their first – Ginger, which I have loved for years. But now I an lemming some Rose Jam! ooh- I really want this!! I do wish it was paraben (and SLS) free- though I don’t think I’m going to be able to resist its charms!! I love deep rose-y scented bath and body products- and this sounds yum! I wish LUSH could go SLS- and paraben-free, too — but nobody’s perfect! The scent is amazing and it actually manages to linger on the skin which is a great plus. I totally agree that if they ever release a full line, I would definitely be there to buy them! But there is something that bothers me a little though, this years Rose Jam seems to be lighter in colour and less opulent… maybe it’s just me because I would hate to see a beautiful product like this go down the “skimping on more expensive ingredients route” because things are getting pricier these days…. The SA said it would be available till around December? But I am SO stocking up on these and not risking anything! If it used to *more* opulent, it must have been amazing! And they sometimes do run out of especially popular holiday items before the end of the holiday season, so I wouldn’t wait too long, either! I hope you’ll have the chance to try it! I just used it again this morning. I really am smitten. I went to both Lush stores near me over the weekend to get some, but both were sold out. I did at least get a sniff from what was left in a tester bottle, so I know I like it. I left my name and number at one of the stores, and they’re supposed to call me when they get more. Okeghem, hey, nothing wrong with that! Bathtime is important! Oh dear. And just like that, you create a HUGE lemming, Jessica. I’ve been on a bit of a rose jag… or it’s more or less a permanent condition, more likely. I’m wondering if this would be stocked at my local Lush or if it’s one of those things one can only order online as it’s Limited Edition. Either way, I believe I really need to get some. Thank you! I also enjoyed the link to the video about sourcing the Turkish rose oil. So sorry, Joe. No, not really. I just ordered a bottle. Everyone on the interwebs seems to love it. Thanks for reviewing it. Kindcrow, my pleasure! I was so curious about this one, and it really didn’t disappoint me! Just bought my bottle of this, after reading your review. I knew that I love the bubbleroon of the same scent. Used the bath gel tonight and it was heavenly. Rose, lemon, violet and vanilla to my nose. The scent does linger nicely, as you mentioned. I love it. Thanks for letting me know about it Be well! Phew, I’m always relieved when someone buys something based on my recommendation and then loves it! Enjoy, and thanks. Lush perfumes are hit or miss for me, but I have yet to find one of their shower gels that I don’t like, and some I unrepentantly love. Grass is my favorite – it’s like lawnmower mulch and a cedar forest, pure green, dank grassiness and woods. Fabulous. I’m not one for rose in the normal run of things, but it sounds like I need to give Rose Jam a sniff. I do appreciate Lush’s balls-out approach to scent; they rarely go less than “all the way”, and I love their raw, bohemian quality.